This Anniversary Wishes collection focuses on wishing friends and family members the best on their big day. Help the favorite couples in your life celebrate the wonderful occasion of the day they were married. Whether you’re writing an anniversary card or talking to the pair in person, you won’t be at a loss for words. Bravo! To another year of sharing sunsets and dreams. Finding the right person can be difficult, but I knew from the first moment it was you. The best thing to hold onto in life is each other. Warmest Wishes and Happy Anniversary! May you both enjoy hearts full of memories. A love like yours lasts! Happy Anniversary! Here’s to you health and happiness! Tip: Use these anniversary messages for photo captions on Facebook and Instagram. IDEA: For the list below of anniversary wishes for brother, use the examples as a guide. Personalize your message with a story that you two enjoy. Make these message come to life with some customization. Note: In tv shows and movies, couples make an event of their wedding anniversary. You should too. Go the extra yard. Buy flowers. Purchases gifts. Go out to eat and make the day special. The quoted authors are listed unless unknown. 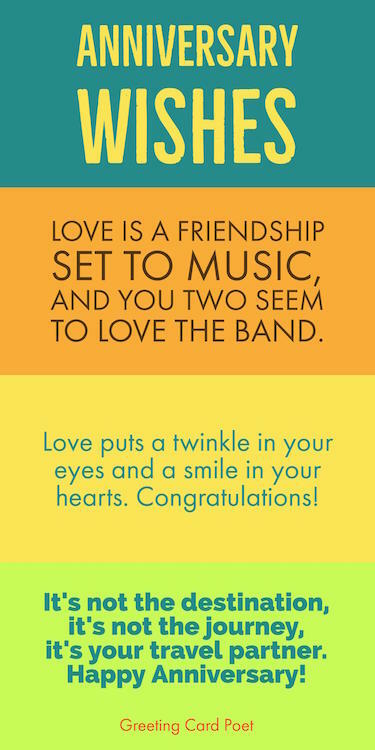 Tip: These anniversary quotes can be included on a card or set the tone for a social media post. You are the finest, loveliest, tenderest, and most beautiful person I have ever known – and even that is an understatement. Better than I was, more than I am. And all this happened by taking your hand. I love you much most beautiful darling more than anyone on the earth and I like you better than everything in the sky. Consider using the words below to create your own wish. Or, enhance one of the happy anniversary wishes listed. Try picking one word from each category and see if you can come up with a meaningful wish. Maybe one of these wishes will spark an idea for something new. Experiment. Edit. You’ll come upon something you’ll like. Words associated with “congratulations”: cheers, best wishes and greetings. Good going, give a hear-hear, hail and greetings. Compliments, awesome job, super and good work. A big hand, applause, commend and standing ovation. Kudos, 3 cheers, hurrahs and praise. Outstanding, well done, congrats and bravo! Words associated with “couple”: Pair, you two, the two of you, duo, dynamic duo and twosome. Partners, partnership, spouse, associates, mate and comrades. Chums, sidekick, cohort, accomplice, companion and playmate. Lovebirds, Romeo and Juliet, combo, and doublet. Combination, team, and two of a kind. Words associated with “wedding anniversary”: Wedding ceremony, taking your vows, and walking down the aisle. Got down on one knee, proposed, festival and celebration. Commemorate, each year, every year, ritual and gala. Observance, wingding and remembrance. Hindi: Shaadee kee saalagirah mubaarak! Did we miss any of your favorites? Use our contact us page and make your suggestions.